will create a summary schedule and has a detail schedule maker that will display the player line up and matches. You can edit the calendar to include explanatory notes or additional event information. allows you to plan and see the entire years schedule at a glance. It is available to all the members and can be easily printed.
. You can find which team your team plays by looking across the grid and finding the team number under the date of the scheduled match. Notes can be placed at the bottom of the schedule to highlight special events. which are calendarized on dates highlighted in yellow. When clicking on the golf league schedule date, the calendar will open up the schedule detail which lists the matches by player name. will open showing matches: player versus player. The player handicaps are also displayed so that the golf league player knows how many strokes to give or get during the match. 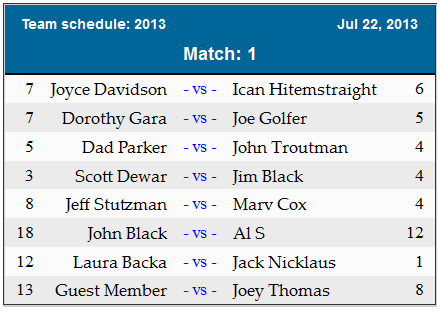 The detailed matches can also be easily printed by any league member and can easily be posted at the golf course. As you can see, GolfLeague's scheduling software, is a great program. It is integrated with other league programs to automate, arrange and create timetables for many tasks involved with running a golf league.